Bboying or Breaking is a style of street dance that originated among African Americans & Puerto Rican youths in New York City during the early 1970's. Fast to gain popularity in the media the dance spread worldwide. While diverse in the amount of variation available in the dance Bboying consists of four things: Toprock, Downrock,Powermoves and Freezes. Bboying is typically danced to Hiphop & Especially Breakbeats. A practitioner of the dance is called a Bboy or Bgirl or Breaker. 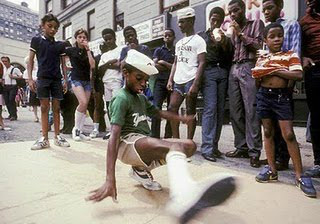 Although the term 'Breakdance' a term created by media is frequently used to refer to the dance. The original term 'Bboy' arose to describe the dancers who performed at DJ Kool Herc's Blockparties which were held in the burrows of the Bronx NY. Kool Herc is responsible for develping the foundational aspects of Hiphop music. The obvious connection of the term 'Breaking' is to the word 'Breakbeat' Bboying is one of the four original Elements of what we know as the Hiphop Culture. A term created by Africa Bambataa to include the sub cultures that organically were taking place in NY City. Hiphop also included the MC, The DJ and the Graffiti Artsist. The recipe of a perfect Blockparty Jam! 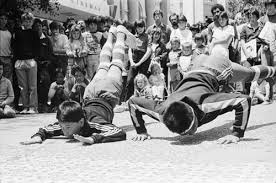 Many Elements of Bboying can be seen in other Antecedent Cultures prior to the 1970's. Concerning Martial Arts, Bboying looks similar to the movement found in Brazillian Martial Art Capoeira which came about in the 1500's. However Bboy pioneers Richard 'Crazy Legs' Colon and Kenneth 'Ken Swift' Cabbert, both from the Rocksteady Crew saif they never witnessed Capoeira when they were young. They say James Brown and KungFu films influenced them instead. 1979 - US Film Warriors released. The film featured Graffiti Artists, the first exposure for most kiwis to the Artform and Hiphop Culture. 1979. The first commercial Rap song released, it stays in the NZ Chart for 30 weeks, peaking at No 18. 16 Year old Darryl Thompson (DLT) is inspired by an Article about Rap and Breakdancing in Life Magazine. 1981 - Release of the Album 'Off the Wall' by Michael Jackson TV Show 'Thats Incredible' shows a Battle between Dynamic Rockers and Floor Masters. 1983, local Youth City and Rural had organised themselves into Crews including, Kinetic Energy, Juice Groove Breakers, Chain Reaction Crew, Porirua Street Rockers, Smurfs and EZ Rock. The term 'Bopping' is derived, apparently a misinterpretation of the term 'Body Popping' - Grandmaster Flash and the Furious Fives 'The Message' is released. The song spends 17 weeks in the NZ Top 50 singles chart, peaking at No.2 The video receives extensive airplay on chart show 'ReadytoRoll', DLT says it was "the first time I'd heard of oppression thatwas similar to ours on the other side of the World" -Malcom McLarens 'BuffaloGals' released, it peaks at no.3, staying in the NZ top 50 for 18 Weeks. 1984 - BOP Olympics held at Mt Smart Stadium in Auckland, with a $2000 prize. Organised by NIck D'Angelo, it draws approx 7000 including Dean Hapeta and Darryl Thompson who meet there. -Movie 'Beatstreet' released. Phil Bell (Dj Sirvere) says it was the soundtrack to this and 'Krush Groove' which began his Hiphop Record Collection. - Maori Producer and Composer Daivanius Prime creates 'POI E' A hiphop style number (it had the right Beats, Tempo and swing for Breaking but did not contain any Rap) sung in Maori by the Patea Maori Club. The video features Joe Moana Popping. POI E topped the NZ Top 50 singles chart for four weeks, spending 22 weeks in the charts. -Friday Night Bop Night 'Breakdance Comp' held at lower Hutt Town Hall. Featuring G-Force Rockers, Porirua Street Rockers. 1985 - The MOvie 'Krush Groove' released. - TV Show 'Shazam' features the first roadcast of the National Breakdancing Champs. 1988 - 'The Semi MC's' from James Cook Highschool are the opening act for Run DMC who played Aucklands Powerstation. - 'House Quake' is held in Auckland considered the first Auckland Dance Party of the New Hiphop Era. -Romanov's is the first Christchurch Bar to feature Hiphop on a regular Basis. 1989 - NZ Numark Dj Finals held in Auckland at Siren. Won By Dj Ned Roy. 1995 - Burn Time video released by Dam Native. featuring the Dam Breakers. 1996 - Jason Nevins vs RUN Dmc 'Thats the way it is' is released. 1998- Breakin Jams at Delux PU office in ChCH, Breakin Jams at YCD Lichfield st, Weekly Monday Jams started at FaithCity, Manukau by Step1, Timebandits hold Bboy workshops ar Crawshaw Primary in Nawton, FUBU Phatjams held at Papatoetoe Rec by Zerial, NewSkool Breakers, Jams held at the Michael Fowler Centre, Welly, Pram City Breakers and Da Squad formed. Rockafella and Rocklyn Squad, CHCH. 2000 - August. First Aotearoa Hiphop Summit organised by Alistair Toto, held in Christchurch. Timebandits battle Blitz Crew. Bboy Summit held in Whanganui. Ewoks, Rush & Defy enter a battle at Ratana Pa with Whetu & Ranui McQueen under the name Blackout Crew, Battle Ewoks in the final. Arataki Breakers then renames itself to Blackout Crew. - August, Rawstyles 2 held at the Auckland Town Hall. Jandel J wins over Step1 in the 1on1;s. Blackout wins crew battles. International guests Peter Pan, Zork One, Taupo Hiphop Throwdown, Liquid Lakes Crew. Respect event held in Lower Hutt. 2001 - Aotearoa Hiphop Summit held in Auckland, with Ken Swift. - Back2Basics local Hiphop Magazine launched at the Summit. - Converse Nationals held at ASB Stadium, FaithCityRockers win over QuiknEzy. - BattleoftheYear NZ Qualifier held at the St James, Auckland. Run by Stormn Norman. Quik n Ezy wins over Faithcity Rockers, Screened throughout NZ on Pukana TV Show.NZ Team BlackAttack represent NZ at BOTY Germany. Samson,Soli,Danny (QnE) Sa (Wicked Wizardz) Matmatix(Soxup) -FUBU Phat Jams held at Papatoetoe Rec, Auckland. Run by Zerial. - BodyRock held in Wellington, held by Tweek & Swerv. Won by Peter Pan & ZorkOne. LokoMotion formed in Auckland by Jose,combined with Fly Rice led by Nik90. Bboys Delight event at Viva with Ken Swift. 2002 - Aotearoa Hiphop Summit, held in Auckland. QuiknEzy (Soli,Steez,Shaun) wins over CommonGround (Jarod,Kbigs,Jono) -BodyRock held in Wellington 13 Jan. QuiknEzy (Soli,Jacob,Samson) win over FaithCityRockers (Jandel J,Steelo, 4orm). Marley wins the Bgirl 1on1 Battles. -Vodafone Planet X Games held in Wellington, Orgainsed by Tweek. QuiknEzy (Soli,Steez,Shaun,Samson) win over CommonGround (Jarod,Dble Oh Jono,KBigs,Indo) FleshMaze Crew formed in Auckland by Samu. Aotearoas Premiere National Female Hiphop Showcase 'Rhapsody Event'. Battleoftheyear 27th July. Judges Patrock & Hawk(freshattack, Germany) Thomas Hergenrother (BOTY director, Germany) QuiknEzy,Instance Movement,Faithcity Rockers,Fleshmaze,Breakamon Kru,RokoFella,Freshstyles,In'n'out',Blackout,Y2E Styles all enter. 2003 - Vodafone X AIR Games held in Wellington. Blackout (Chester,Rush) win over QuiknEzy (Soli,Doc) - Aotearoa HIPHOP SUMMIT, held in Auckland. Short Ewok wins over Mayhem. -BODYROCK held in Wellington 18th Jan Shed 6. Soli (QuiknEzy) wins over Kouta ($7dollar) showcase battles: Soli vs Kaytel, Danny vs Strike, Tweek vs Sheeq, 4orm vs Creka, Jono vs Haini, Dash Rock vs Mackie, Swerv1 vs Carlito, Step1 vs Steez. 6 round battles. International guests: Bboy Wicket, Bgirl A-Bgirl. BBOYS DELIGHT held in Wellington Town Hall June. 2004 - BODYROCK held in Wellington 9th Jan 5th Anniversary. Rush (Blackout,$7) wins over Pepito (freshSox, OZ) FLOORPLANS Bboy Event held at FaithCity 11 Sept by Step1. BEATSTREET, Hamiltons Hiphop Event held on the 30th April. 2005 - BATTLECRY Bboy Event started by Step1, Sheeq and Graffit Artist Pest5. Held in Auckland. BEATSTREET, Hamiltons Hiphop event held in May. BODYROCK6, Hosted by Tweek, Swerv1 held on the 14/15 Jan, International guests Alieness, Steelo, Bgirl Citrus, 1v1 bboy Battles. BREAK THE HABIT' 3on3 Bboy Event, held at Destiny Church, Auckland. 2006 - 'Break' overseas production show held at Telstra Clear Event Centre, Manukau. festuring Urban Action Figure, US. - BATTLECRY held in Auckland, X AIR Event Bboy Battles, Welly. BODY ROCK Event in Welly. BEATSTREET, Hamiltons Hiphop event held April 19th, 3on3 Bboy Battles. Boost Mobile STREETBALL TOUR, Wellington, Palmerston North, Hamilton, Auckland. Bboy Comps. BREAK THE HABIT 3on3 Bboy Event. Destiny Church, Auckland, Special Guest Lilou. 2007 - EASY STREET 1 organised by Cisco Funk (Vincent De Haas) in Kilbernie, Welly. BoogieHood Connection Crew represents. BEATSTREET, Hamiltons Hiphop Event held on March 23rd. 2008 - BEATSTREET, hamiltons Hiphop event held on June 9th. featuring 3on3 Bboy battles. 2013 - HOMEGROWN 2nd March. Wellington. 2on2 Bboy Battles. Winners, Akorn & Grub-D. CommonGround. CHCH. RED BULL BCONE NZ QUALIFIER June 22nd held at Red Bull Auckland Headquarter hosted by Step 1 with special guest Bboy Roxrite, Renegades/BCONE ALLStar USA who does Workshops in Auckland, Christchurch and Wellington. Bboy Akorn wins and reps NZ at the Asia/Pacific Final, CommonGround Crew. BATTLE OF THE YEAR NZ 2on2 BGIRL QUALIFIER, August 3rd held at the Mangere Arts Centre, Auckland by Step 1 & thebreaksnz 2on2 BOTYNZ Bgirl winners H (Voltron,Blackout) & Deemite(U-Knights) rep NZ at BOTY, Germany. Akorn wins the 1on1 National Bboy Battle . BATTLECRY Nov 23rd held at OMAC by Step 1 & thebreaksnz. National Crew Battle winners, Fleshmaze. Popping Battles & Bgirl 7toSmoke won by Deemite, U-Knights Crew, Hamilton. 2014 - STEP CORRECT January 11th. Hosted by Critter & Faybes, Mt Maunganui. Tauranga. 3on3 Bboy Battles Fleshmaze Crew winners. Nate,Mayhem,Hugga. HOMEGROWN Feburary 5th held on the Wellington Waterfront 2on2 Bboy Battles Akorn & Grub-D, Commonground Crew win. . BATTLE OF THE YEAR NZ SOLO BBOY CYPHER June 7th held at Zeal, Henderson. Auckland by Step1 & thebreaksnz Special Guest Bboy YNOT, Rocksteady Crew, who does a workshop tour Auckland,Hamilton,Wellington Hosted by Stretchmark,Sen,Color,H,Step1. BATTLE OF THE YEAR NZ QUALIFIER 2on2 Bbgirl & Solo Bboy July 19th held at the Q Theatre, Queen St. Auckland by Step 1 & theBreaksnz, Solo Bboy Winner. Hugga Bear, Fleshmaze Crew. 2on2 Bgirl, Nossy & Legend, AKL Bgirls. 'GOT SKILLS' REDBULL BC ONE. BATTLECRY September 6th held at OMAC hosted by Step 1 & thebreaksnz. This is a 'living' timeline and will constantly be updated and revised as more an more people add their knowledge to this. It is in noway complete or limited to what is documented, alot of this info has been gathered from a wide variety of sources so may even not be acurate. So we need ya help keep this record up to date and acurate. Thanks to all those who are constantly passing on their knowledge and history of the NZ Bboy scene. Peace.Love.Unity. If you have anything to add PLEASE contact us.